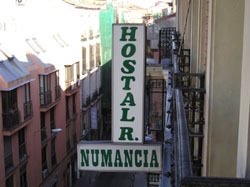 Hostal Numancia - Guesthouse in central Madrid, Spain. 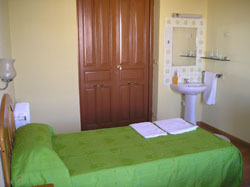 Hostal Numancia has 9 rooms all recently renovated, clean and comfortable, with sink/wash-basin, heat, hardwood floors and shared bathrooms (1 bathroom for 3 rooms). We have a left-luggage service and daily cleaning service. The Hostal is run by a young couple who speak several languages.There are several car parks near the Hostal so that parking in Madrid will not be a problem. Location: Hostal Numancia is located in the historic centre of Madrid near the metro station of Tirso de Molina (Line 1) and several bus lines pass by the same street. 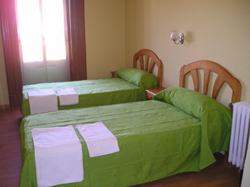 Atocha Railway station is within 10-minute walking distance of the Hostal.